I was a weird kid. When I was deciding whether or not I wanted to transfer schools from a private prep to San Marino High School, one of the best public high schools in the state of California, the biggest factor in my decision was the thought that it’d be good to go to school with more “different” types of people. In other words, I thought a public high school would imply more diversity. My prep school was probably (by my estimates) 30% Asian, 50% Caucasian, and 20% other. San Marino High (by my estimates) was about 65% Asian and 34% Caucasian, and 1% other. As you can see, it turned out the public school was much less diverse. 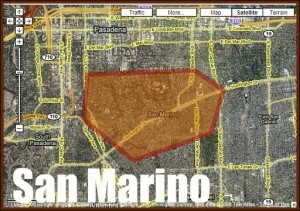 Let me take a step back and give you a little background on San Marino itself. Telling people you’re from San Marino has the effect of telling people you are a spoiled rich kid who drives a Mercedes. That’s why I hate telling people that I grew up there. I usually just say I’m from Pasadena and leave it at that. My first days at my San Marino High School were a blur. I’d never been around so many Asian/Asian Americans before. I admit, it was a culture shock. For the first time in my life, I was at a place where I was truly the majority. And although this helped give me a strong sense of my racial identity, this caused problems at the school itself. There were tensions that I felt. It was all unsaid but I knew they were there. I knew San Marino had gone through a seismic shift in the last 20 years but I didn’t know how it happened or why. That’s why I was so fascinated when I read the article, “How an Exclusive Los Angeles Suburb Lost It’s Whiteness,” by Merlin Chowkwanyun and Jordan Segall in The Atlantic Cities. You can read the article yourself but what I found interesting was the back story on how the community went from almost being completely white (in 1970 it was 99.7% white) to today where less than half (49.8%) are white. This caused racial tensions. The article cites one incident where an Asian American student was attacked by three Caucasian kids on a tennis court. According to the article, the community eventually came to accept the “Asianization” of San Marino but what I find interesting is that the community hoped that the Asians would “assimilate rapidly into their adopted community by learning to speak English, participating in civic activity, donating to local institutions, and raising behaved, academically elite children.” The hope was that this would lead to a place where Asian/Asian American and Caucasians could co-exist peacefully while also retaining the “character” of the community. It was that tension that I felt back when I was in still in high school more than 15 years ago. I’m not sure if that same tension exists today but I wouldn’t doubt it. And (as the article brings up) what happens as the number continues to grow? Can the city retain it’s exclusiveness – aka: the housing prices – when the entire community becomes Asian? Personally, I believe it can. However, the question I’d like to know is what is lost when a city becomes one race? Does it become “better” or “worse”? And where’s the best place to raise an Asian American kid with a strong sense of identity — a place where all the people are Asian American or a place more diverse? I don’t know the answer to these questions but I’d love to hear what you think. For more about the rise of Asian majority suburbs, read my fellow 8Asians writer Jeff’s article, Documenting The Rise Of Asian Majority Suburbs: Numbers And Implications.